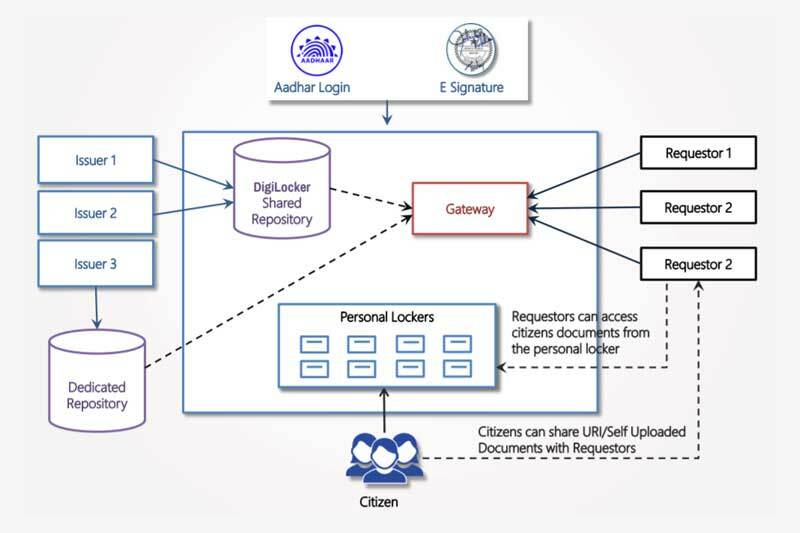 What is the Indian government’s DigiLocker platform? On September 7, the Indian government announced the integration of Driving Licenses (DL) & Vehicle Registration Certificates (RC) with its dedicated cloud storage space service, called Digital Locker or DigiLocker. Following this integration people will no longer need to carry around physical copies of their RCs and Driving Licences. They can instead access digital copies of the same on their mobile phones via the DigiLocker mobile app. DL and RC documents can now be issued directly by the authorities to the DigiLockers of individuals in digital formats. These digital copies can be shared with other departments as identity and address proof. They will also be used for on the spot verification through the citizens’ mobile, by various law enforcement authorities like the Traffic Police. In addition to boosting convenience, this will also result in assured authenticity of such documents and reduction of administrative overhead. Education Boards have started issuing digitally signed copies of marksheets and graduation certificates to candidates into DigiLocker, in addition to the traditional hard copies. Banks (here and here) are integrating their digital banking systems with DigiLocker. Digital LPG subscription vouchers are available in DigiLocker through a partnership between the Ministry of Petroleum and public sector petroleum companies, such as Indian Oil Corp. Ltd., Bharat Petroleum Corp. Ltd. and Hindustan Petroleum Corp. Ltd. In May this year, NITI Aayog (National Institution for Transforming India), the premier policy ‘Think Tank’ of the Government of India, released its Three Year Action Agenda, 2017-18 to 2019-20. The Agenda identified three key enablers, to provide the backbone for digitisation of the government’s end-to-end service delivery. One is the by now well-known Aadhaar, a 12-digit unique national identity number, assigned by the Unique Identification Authority of India (UIDAI). Over 85% of India’s population had enrolled as of July 2017. While Aadhaar is supposed to take care of the identity and authentication aspects, eSign and digital lockers are expected to provide two other crucial pieces of the e-governance jigsaw. DigiLocker, which was officially launched in July 2015, provides a dedicated cloud storage space to Indian citizens who sign up for an account. It provides a platform for digital issuance and verification of documents & certificates, such as driving licenses, voter identification, school certificates etc. There are three primary stakeholders in the DigiLocker system: 1) Issuer: Entity issuing e-documents to individuals in a standard format and making them electronically available e.g. Education Bords, Registrar Office, Income Tax department, etc. ; 2) Requester: Entity requesting secure access to a particular e-document stored within a repository (e.g. University, Passport Office, Regional Transport Office, etc. ); and 3) Resident: An individual who uses the Digital Locker service based on Aadhaar number. The main technology components of the DigiLocker system are the Repository (Collection of e-documents that is exposed via standard APIs for secure, real-time access); an Access Gateway (a secure online mechanism for requesters to access e-documents from various repositories in real-time using Uniform Resource Indicator or URI, a string of characters used to identify a resource) and the DigiLocker Portal. An account can be created by using a mobile number which is authenticated by sending an OTP (one-time password), followed by the selection of a username & password. In January 2017, UIDAI was integrated with DigiLocker as a registered issuer. After the DigiLocker account is successfully created, the citizen can voluntarily provide their Aadhaar number to avail additional services. The Aadhaar authentication can be done either via an OTP sent to an Aadhaar registered mobile number or by using fingerprint. Documents are added to DigiLocker via two routes. The first is a push mechanism, where the issuing authority’s database is seeded with the Aadhaar number of the citizen. Once a registered of the document issues an e-document for a particular Aadhaar number and the respective DigiLocker account already exists for that Aadhaar number, the URI for that document will be get pushed automatically into DigiLocker. When the issuer database does not contain the seeded Aadhaar number but the issuer has a partnership with DigiLocker, citizens can log into DigiLocker and pull their record from the issuer database using some common search parameters. Once the record is fetched, a permanent link to it can be saved in the issued document section. In both cases described above, the URI (link) is available in the issued documents section. This link directly fetches the document in real-time from the original data source. Citizens can also upload scanned copies of their legacy documents in their accounts. These legacy documents can be electronically signed using the eSign facility. The documents issued into DigiLocker do not exist in the form of a separate copy. Only a reference link to the original source is provided. Whereas, for the documents uploaded by the citizens can be accessed in a manner similar to Google Drive or DropBox. 1 GB of storage space is provided for the uploaded documents. The platform enables citizens to access their digital documents anytime, anywhere and share it online. It reduces the administrative overhead of government departments through an efficient, paperless process. It also makes it easier to validate the authenticity of documents as they are issued directly by the registered issuers. Self-uploaded documents can be digitally signed using the eSign facility (which is similar to the process of self-attestation). According to the latest statistics, as of August 2017, there were more than 8 million registered users in DigiLocker (around 0.6% of India’s population on a base of around 1.3 billion). There are 34 issuer organisations and 14 requestor organisations at the moment. The states of Tamil Nadu, Uttar Pradesh and Maharashtra had the highest number of Aadhaar-linked accounts at 316805, 270602 and 254457 respectively. The complete list of documents, registered issuers and requesting authorities can be accessed under different tabs on the statistics page: https://digilocker.gov.in/public/dashboard. In March 2017, the Ministry of Electronics and Information Technology (MeitY) invited applications for licensing of Digital Locker Service Providers (DLSPs). Applicants will build their digital locker service in conformance to the Digital Locker Technology Framework and security and procedural guidelines published by the Digital Locker Authority. Usage by citizens needs to increase significantly, which in turn would require more central and state government departments to come on board and start issuing documents digitally, before Digilocker can make a real difference. But if implemented correctly, DigiLocker could be a key component in a successful transition to e-governance.